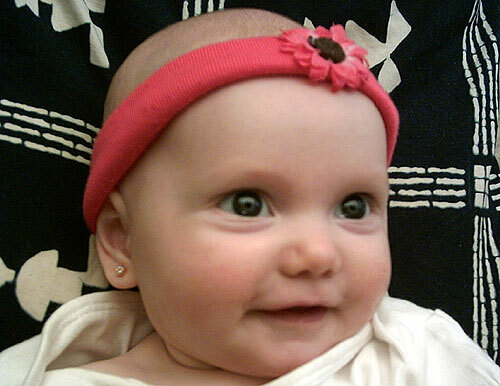 This pic was taken this morning, soon after her ears were pierced. At almost four months, Aïcha is a happy little girl. wonderful. She is currently very interested in anything orange/yellow and laughs while bouncing on my knee. She has just discovered Daddy’s beard for pulling on. bubbles with her own saliva. She loves our walks every morning and watches the trees disappear over the top of the pram as I push her along. Last week we conquered Mount Kosciuszko (the highest peak in Australia) together. I held her strapped on my front in the sling.